Early Alert Canines (EAC) seeks volunteers to become dog foster parents in their home. If you love dogs, and are willing to commit to spend quality time with them, this opportunity is for you. 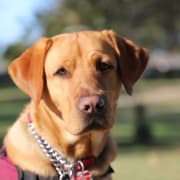 It’s a lot of work, but it’s very rewarding to work/live with our well-trained service dogs and see them go on to change the life of a diabetic. This position offers hands-on experience and training in service dog handling. Fosters attend a two day orientation that will increase their dog handling skills and learn the specific commands and care that our dogs know and need. A manual is provided for your reference as well as trainers to consult with over specific concerns. Also a home check is required to provide an environment that is safe for our service dogs. Fosters must be able to remember details regarding the individual dog handling needs. Job involves physical work, standing and moving around; handling dogs weighing between 40- 90 lbs. We supply the training, food, medication, and vet care. Most of our dogs are full access service dogs that go shopping, to movies and restaurants, to the beach and hiking, and to work with you if your employer agrees. This is an excellent opportunity for those who want a canine companion on week nights and weekends and can make the commitment to provide a caring and stable environment. The dogs work/train/play at our EAC facility Monday- Thursday 9:30 am - 3:30. We are looking for fosters who live/work within 30 minutes of our facility who can drop off and pick up the dog Monday through Thursday. Must adore dogs! Orientation and training will be conducted at the EAC Center in Concord, please RSVP to 925-349-5190 or email to info@earlyalertcanines.org. A phone interview, training, orientation and house check is required prior to placement of the dog.